Thurs. May 29, 2014…..Another busy week, although this one didn’t start out with work….I had some play time, long overdue after about 26 straight days of guiding. 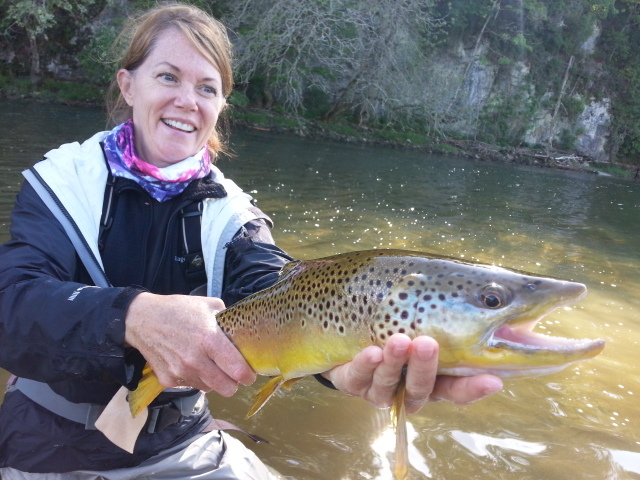 I had the pleasure of “guiding” my lovely bride Kathy on the South Holston two days….her favorite river…….the lady is gorgeous, can cook like you wouldn’t believe, puts up with me, and loves dogs, the outdoors, hiking, camping, flyfishing, bluegrass music…..brown trout, and the South Holston……incredible. Just a few of the reasons she is fantastic…and the catch of my life. We hopefully will be fishing the sulphur hatch, slinging some meat for big browns on the Bluff City end of the river, and maybe looking for a few stripers at the Bluff City stretch there too. That is what I wrote before the trip, and that’s pretty much what we did…..and a whole lot more. 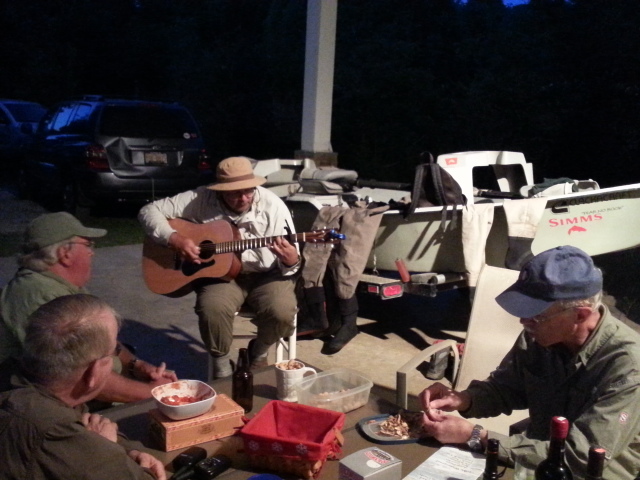 Here’s more of the scoop…….It was a great memorial day holiday, What do fly fishing guides do on a day off during prime time season? Go fishing, what else. Great to get in a prime time vacation as this is my busy season, but we just had to get away for a day or so for a break. 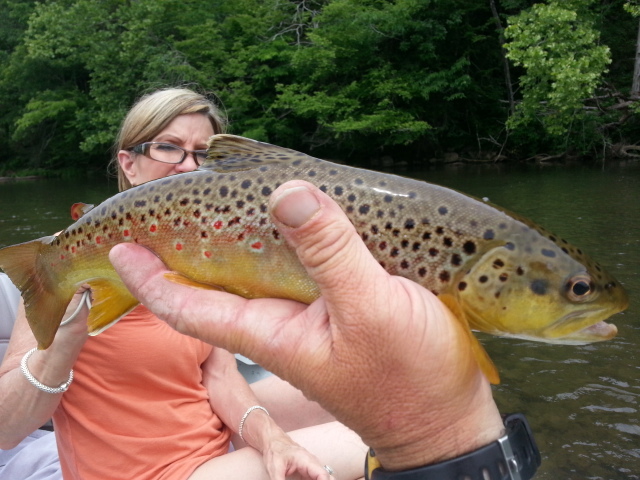 My wife Kat and I floated the South Holston on Sunday, did very well scoring some nice browns up to 23″, several nymphing and several on dries, she caught a couple of 21 -22″ fish, we also caught some on sulphur and cranefly imitations, and good terrestrial fishing can’t be far off. Lots of fish in the skinny water…. We floated from lower river to Bluff City. 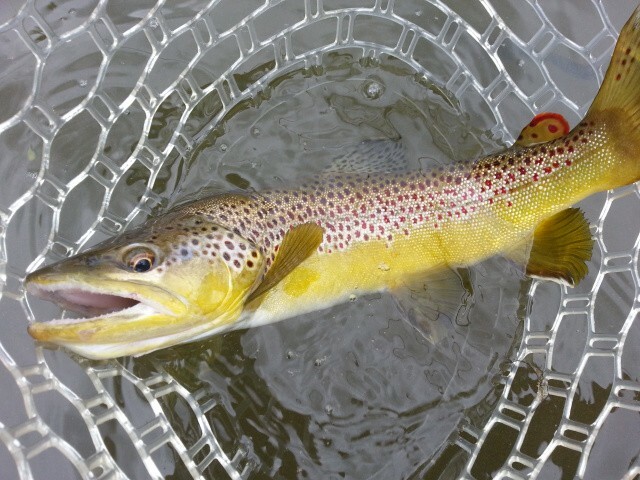 I’d say we put probably 20 to 25 fish in the boat, and she hooked up on a fish we fished to for an hour, the largest brown I’ve ever had someone hooked up to, it was well over 30 inches…it ate one of my friend/client/fellow guide from Pennsylvania Ken Okorn’s secret mink nymph patterns. Kat played the fish well for about 6 or 7 minutes…..it was a beast. We hooked it nymphing one of my favorite deep slots just before the river dumps into the lake. She played it well, was getting a little tired, and handed the rod off to me…and what did I do? Played it for about 5 more minutes and the fish made a series of tarpon like jumps and the fly pulled free. A near three foot long brown trout I would have estimated at 14 to 16lbs….or somewhere in that neighborhood. The personal largest I or any client of mine has hooked up on . Made me think of the huge brown my client Tom Wright landed with me in 2007 that was 12.5 lbs….. This fish was way larger than that beast. There aren’t words to describe what I felt……should have let her finish the job. She was doing great, should have insisted she keep fighing it. But I will say its rare to hold a fish like that on 4X or 5X, which is what we did. I felt a small victory in that the fish didn’t break us off… I had one other fish follow one of my rabbit strip flies to the boat that was a little smaller but not by much, but I couldn’t get him to eat. Bummer. We floated to takeout then went upstream to try to catch a spinner fall for some wade fishing and caught some more fish, maybe a half dozen or so, but not on spinners. All nymphs. There were spinners in the air but the air temps were a wee bit warm for the event to happen before dark. But there were a gadzillion of them. 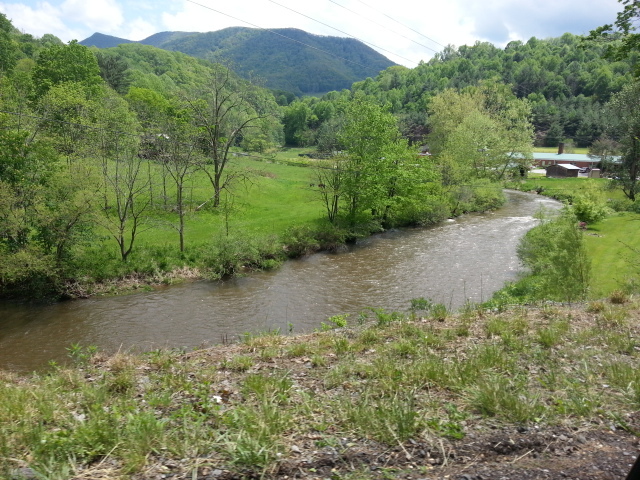 We spent Monday riding through some of our favorite places…..Elizabethton, Johnson City, Butler, Pandora, Mountain City, then headed over to a NC water for a few hours fishing in the afternoon. Grabbed some lunch for a picnic from Mikes’ BBQ, in Mtn City, TN, one of my favorite eats. We had a picnic below Sharp Dam on the North Fork. It was fabulous. 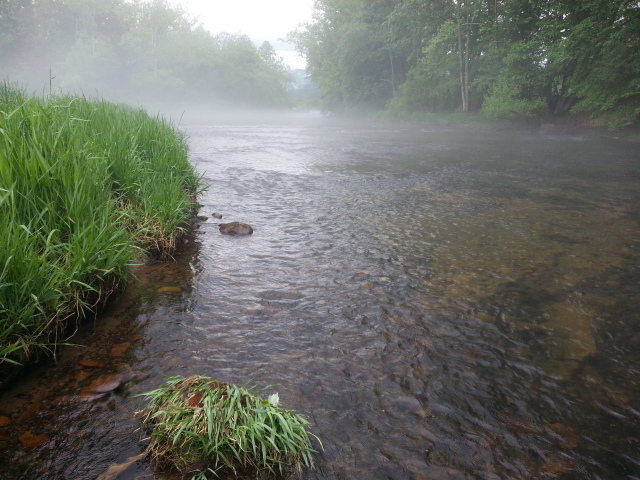 We then went fishing for few hours on one of my favorite NC small streams….It was good as well, Kathy landed about a dozen fish in two hours fishing, I think I caught 3 or 4, plus a large brown of about 22″ which she caught. It was great. We clipped off about 3pm, headed over to one of our favorite bike routes along the New River, and biked about a 5mile stretch along the South Fork……it was great. We finished up with a near sunset picnic dinner on the banks of Smithey’s Creek Park on Kerr Scott Lake….and it was the perfect ending to a great trip with my bride. Spent a good deal of time the past two days catching up , updating my sites, and catching up on fly orders and messages…..plus getting in a half day of fly fishing for bass and bluegills….spent a half day on one of my local haunts….and yes I do some half day guided trips here as well…..all summer long. Got an early start and was in the water at 720am….nice and cool early after some thunderstorms….. The bite was on. 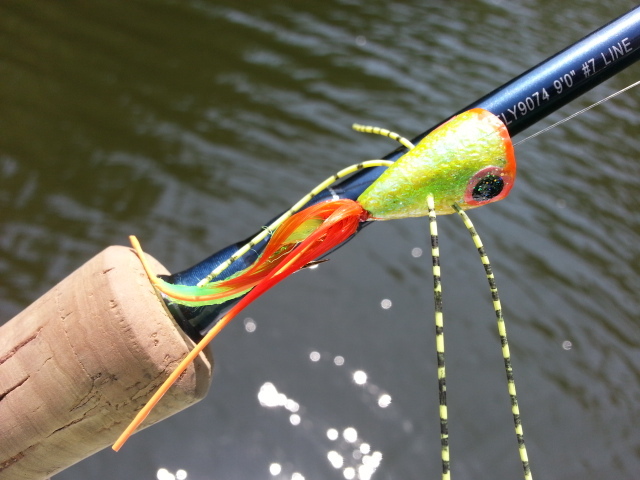 The topwater bite is excellent early and late for bass right now and the bluegill have just begun to spawn. It was insane. Some days are good,…..this was insane. Landed somewhere north of 100 bluegills…all hand sized and many larger…plus 20 bass, one of which was an 8.5 lb beast that I saw cruising and sight fished a popper to from 60ft away. It was over a tree lap, in bright sun, where I could see the whole thing materialize right before my eyes. I made one false cast and shot the line to the fish…popper landing about six inches to its left. It turned, tilted up, and the bug disappeared in a swirl the size of a trash can lid. The bulldog fight was on….I kept the rod low and line tight and inverted the rod so as to get maximum pressure on the fish and keep it from burying in the tree…which he tried three times and I stopped him everytime. Within about 40 seconds over 8lbs of largemouth lay in my landing net. Incredible. All the sweeter that I saw the fish, had to make a spot on cast, and got to see him eat. The bass boat nearby was looking at me and the boat really funny like “what kind of boat is that?” And that I was fly fishing I am sure made it all the more comical. 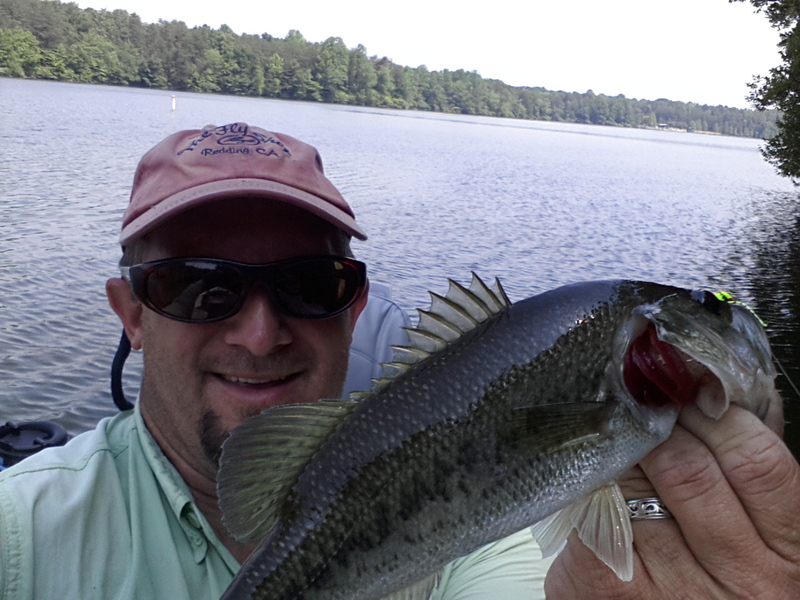 After a few dozen bluegill, several bass, and the 8lb plus beast….. I guess they took me a little more seriously. I must admit I loved it….. Amazing how many lakes there are where the fish never see flies, and thus are totally duped by them because they’ve never seen them. An advantage…. 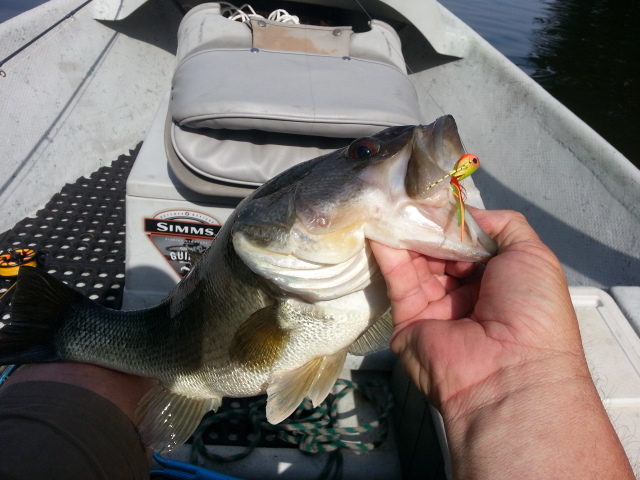 Saw tons of cruising fish….typical of post spawn bass that are ready to eat. We have had so little rain that sight fishing is not only possible right now but in some ways the main event. 80% of the fish today I was able to see them eat it….and at least 80% of them were on the surface. 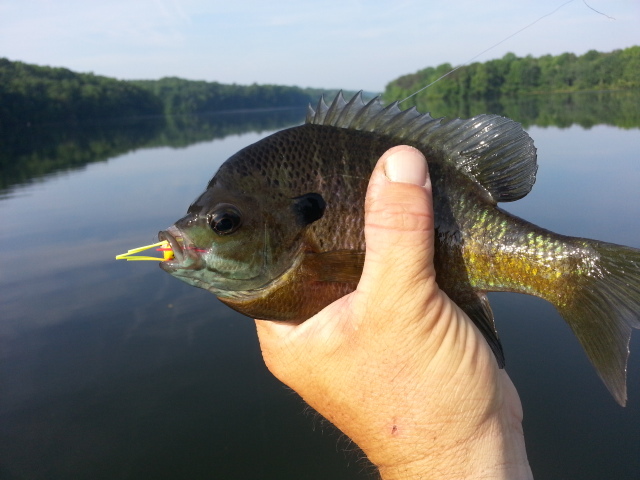 Its kind of neat we can anchor off a point and sight fish to bluegills at long range…..its a hoot. Great fishing in our own backyard…have some open dates coming up, and can do half days…half day morning is as good as it gets. In fact, right now I have the mornings of June 9, 13, 25, and 26 to do just that. This is a 1/2 day boat trip, about 4 to 4.5 hrs of solid fishing…….or catching….a trip special and is $85 for one person, $125 for two. Yes, $125 covers two anglers. Catch a ton of fish and never leave town. Call or text me at 336-944-3628, or email me at jwflyfishing@gmail.com if interested. We’ll catch a bunch of fish…….. and learn some new tricks you can take to your favorite local lake or pond and do well. Will have some more dates in July for this also if interested. 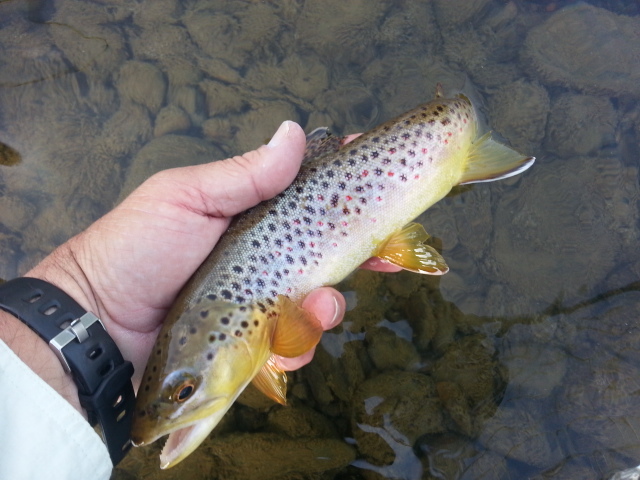 Ending up the week with a couple of South Holston trips, one float and one wade trip. Today’s trip, scheduled with Mac Cheek, we postponed due to thunderstorms. Not heavy rains and blowout conditions or mud, but lightning bolts. Something about lightning dancing about the sky every 45 seconds that makes one giddy. Yikes…..Kaboom. Mac and I rescheduled for July 3, should be a good day. Sulphurs and terrestrials with midges sprinkled here and there……and a few bwos and craneflies mixed in for good measure. 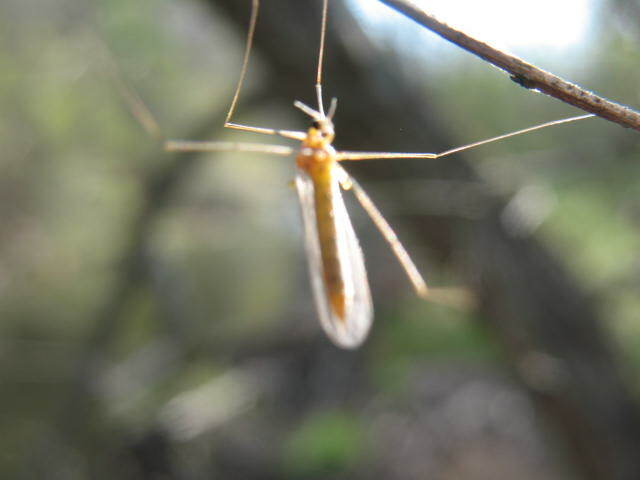 Craneflies (below) are a ubiquitous summer insect on the SoHo and many waters, particularly tailwaters…..and the SoHo and Watauga both have a lot of mud banks that are home to incredible numbers of cranefly larva. Fish love them. Typical, normal SoHo summer stuff……with a cherry on top. Have an early trip on Friday, will be guiding Bob Stanford, Greensboro, NC, and looks like we could have some showers/t-storms but they should be gone by midday, leaving us with cooler temps which will be kind of nice. We will be fishing several stretches of river and hopefully catching a sulphur flurry a few times on different stretches of river. On Saturday, I’ll be doing an NC trip guiding one of my regular clients Don Daniels and his father Tom, and Don’s two sons Zachary and Clayton…as well as another regular client Ray Parks. Should be a fun day, Don and Ray are always a blast to spend a day on the river with. Better have the terrestrials on deck…..with our dry, hot weather we are seeing tons of them already. Streamside foilage in most areas is rife with ants and leafhoppers and inchworms…. and beetles will be on the docket soon as well. Like right now. 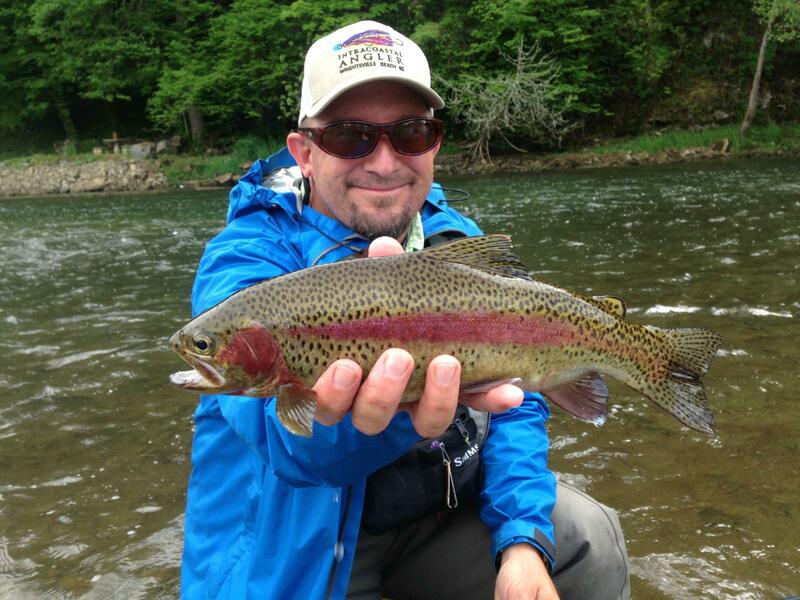 Terrestrial fishing is some of my favorite of all….especially when it is sight fishing. 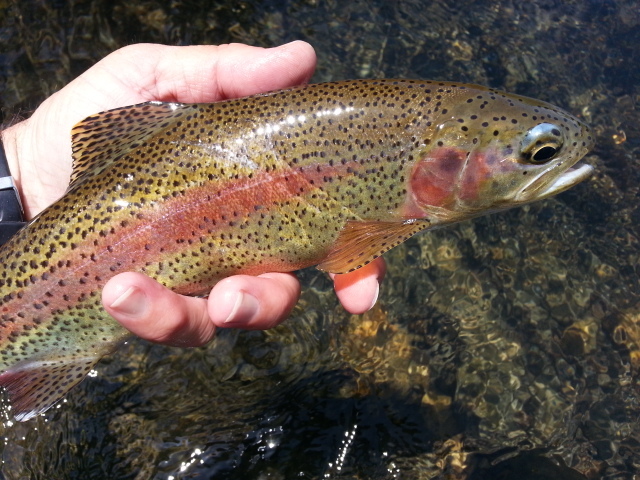 Its top shelf fly fishing in every sense…and will ruin you if you have never done it. Come see why I love it, I can show /teach you the fine art of stalking fish and picking them off with a terrestrial. Its a way to reap a bounty for those who know of it……and you can catch fish that can’t be caught in any other way. Have a great weekend………enjoy your Friday….more to come from the water.! Tight Loops and May all your Hatches Match…. Sat. May 24, 2014…… Whew……catching my breath. Got an unexpected break today due to some pesky thunderstorms that blew us out yesterday on the Clinch headwaters….then same thing today. Had a string of 24 straight days…but hey its time to make hay. A bitter cold winter and spring meant I am making up for a slow late winter /early spring so had to play a little catch up. And I have done just that. But have gotten a little slack posting reports due to the past month of several groups….preparing all the days meals- – -breakfast, lunch, and dinner as well as guiding and tying flies at night. A full schedule for sure, with a little website update here and there. Its been a good month, albeit some unusual conditions….though certainly still in the realm of normal. But here’s a quick update on the past week…. May 18 through May 22 I guided a group Trip on the South Holston, one I do every may for these guys, Joe Craig, High Point, NC, UNC University System President Tom Ross, Rusty Walker, Locke Clifford, Bill Leinster, Ron Davis, Wendell Ott, Andy Gwynn, and on the South Holston tailwater, hatches were spotty, but we still caught a lot of fish, we had some sulphurs early and late, and mainly late, and the nymph continues to be good and the way to catch numbers of fish when fish aren’t rising, pretty standard anywhere not just here. Midges and sulphur nymph imitations early, mostly sulphur nymph imitations midday to early afternoon. Not the usual foray of dry fly nirvana of years past, but the guys had a great time, I think we caught 50 to 60 fish each day and the weather was great. Also did a half day float on 5-22 with Brad Ball and Stephen Starnes , so these two reports run together. A string of 18 hr days so I’ve been so busy I haven’t updated the site as much as I reported above…. We did mid Big Springs to Boone Lake and dodged thunderstorms all around us, did a short float on the lower river…we didn’t kill them, caught a few, narrowly escaped getting drenched and missed a good chance. A few sulphurs popping, but water temps are up and the hatch hasn’t materialized on much of the middle to lower river the way it can. Late afternoons and evenings offer the best shot at good surface fishing, and the occasional riser you can nail on a sulphur dry, but the way to catch numbers continues to be nymphing. That should change once TVA gets back on normal pattern of some full generation. Had a Friday Trip, guiding Paul Riley, Fred Gebarowski, Cary, NC, on one of our premier Va Private Waters…Little River, Big Cedar Fork….we had some early morning thunderstorms that blew things out and before we could get in and get to fishing the water rose and was muddy. Interesting, the line of storms went only over the watershed we were fishing then crossed into East TN and NW NC and there were flooding rains all the way down to the NC/SC line. We fished about 3 hrs, with limited success…2 big rainbows, a redeye, and about a pound and a half smallmouth. Other than that, it was a bust. We’ll be rescheduling…. At the end of the day I did a two hour casting lesson with Diane and Scott Bertrand…..We did the lesson, I delivered a few dozen of my favorite CDC sulphur patterns that have been fooling those tough SoHo browns all up and down the river. Been getting a ton of calls for flies as folks are finding some challenging fishing so looks like in addition to trips I’ll be doing a ton of fly tying in addition to my own tying as I tie all my guided trip flies. 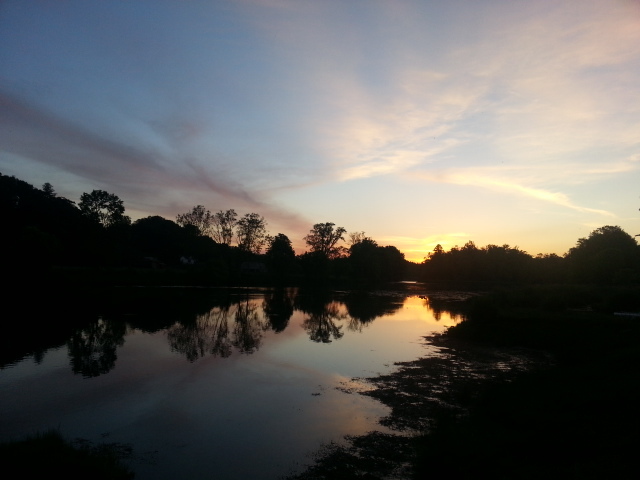 Took these amazing shots on the river upstream on the upper river….stunning! A full day for sure…. I will be doing a short ‘vacation’, something needed at the moment, and will be “guiding” my lovely bride Kathy as she wants to fish/float the South Holston two days….her favorite river…….the lady is gorgeous, can cook like you wouldn’t believe, puts up with me, and loves dogs, the outdoors, hiking, camping, flyfishing, bluegrass music…..brown trout, and the South Holston……incredible. Just a few of the reasons she is fantastic…and the catch of my life. 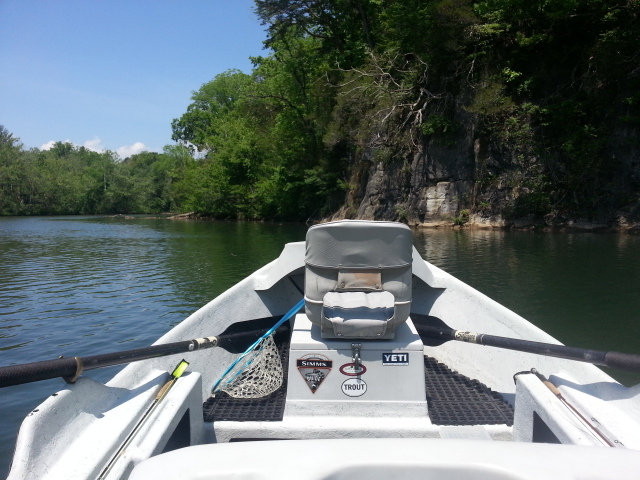 We hopefully will be fishing the sulphur hatch, or slinging some meat for big browns on the Bluff City end of the river, and maybe looking for a few stripers at the Bluff City stretch there too. It will depend on water/flows. We will also likely do a small stream in the area as well. Always a great thing to fish with Kat, the South Holston is where we met many years ago and some of our early fishing dates were day trips up from Greensboro, NC. A client introduced us, and we’ve been together ever since. A lady who is godly, loves to flyfish, can cook, and is gorgeous as well. As I have said I have better than I deserve….! In any case, have a safe and happy Memorial Day Holiday, and remembering all those and thank you to all Veterans, many of whom paid the ultimate price and many who are doing that right now to ensure we have a safe and free place to enjoy life. America is a great nation, and our military folks are the best. Thanks to all of you…. 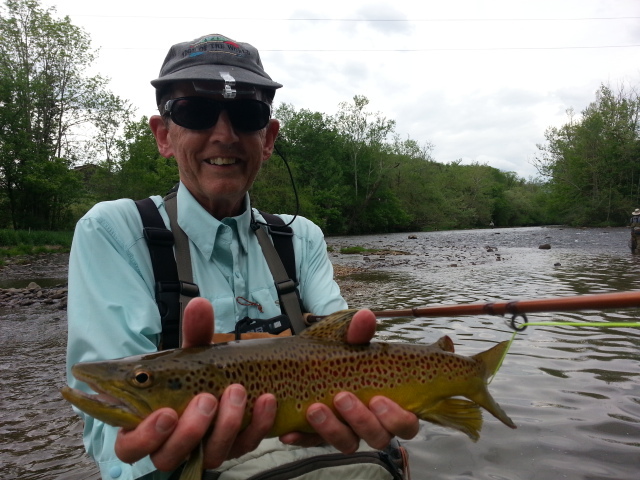 Tues. May 20, 2014….Great two days on the South Holston River with Joe Craig group….been guiding Wendell Ott, Joe Craig, Andy Gwynn, Tom Ross, Locke Clifford, and Bill Leinster. 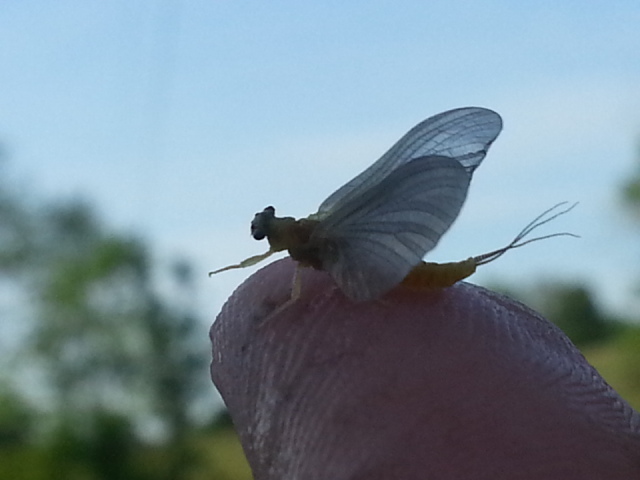 The Sulphur hatch has been spotty bit we have still done very well on dries and dry dropper rigs. We have landed 50 to 60 fish each day with Tom Ross landing the largest fish .. (browns of course). We have one more day of sunny stable weather to come then more storms on Thursday. Hope we don’t get blown out. Mon. May 19,2014……Wow, May is nearing the home stretch….been a busy month so far. 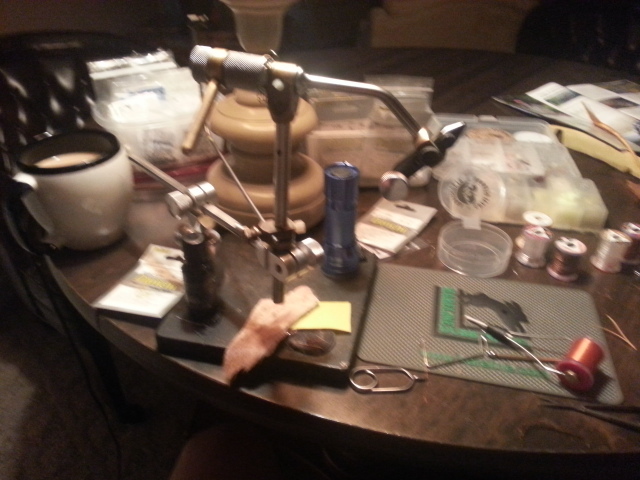 Up and at it early this morning, tying some flies for our fishing today. This time of year I will average tying 4 dozen a day for fishing when we are fishing hatches. Mostly to have a variety of flies or weapons at our disposal. Today I am guiding Joe Craig, Tom Ross, Wendell Ott, Bill Leinster, Locke Clifford…and this is a trip I do for them every May. 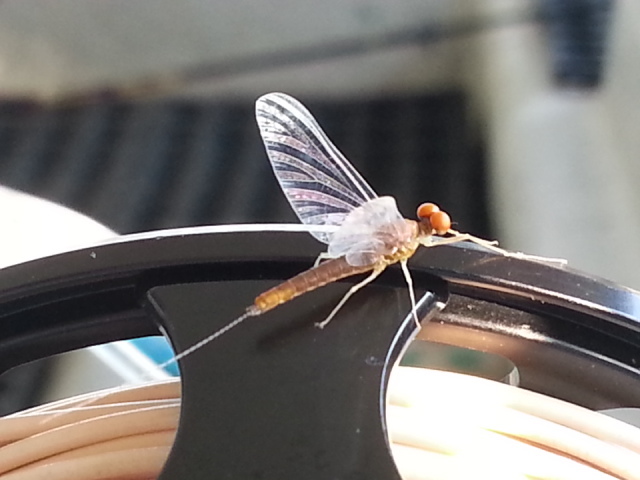 A May mayfly madness trip…..looks to be a good one again. I guide them and prepare all their meals……a string of 18hr days coming…..time for another cup of coffee. I will have these guys through Thursday morning, and then Brad Ball and Stephen Starnes on Thursday afternoon for a float. 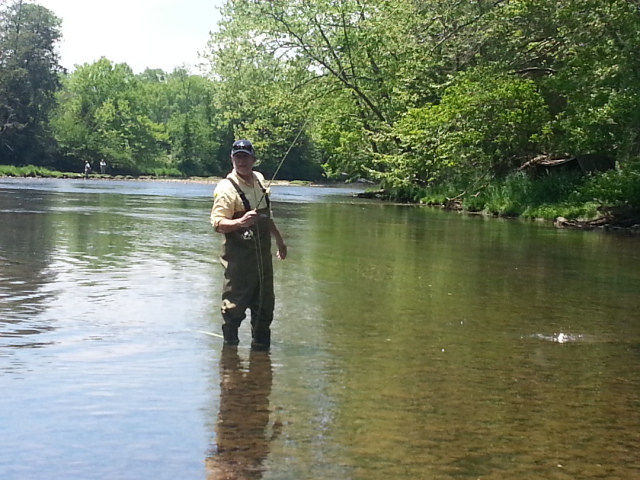 Fri I have a private water SW Va trip, then Sat I will be guiding Al Lundquist on some NC water. Fishing is stellar…….have a great Monday. More to come later from the river. Sat. May 17, 2014…. Got an early start today guiding two of my regular clients from Dallas, TX, Harry Winters and Sam Clay, we fished NC water and arrived to chilly conditions. Morning temps were in the 30sF and very breezy as well. The water was still up but clearing from recent heavy rains. We nymphed all day didn’t see a riser all day long even though yellow stones were out, as well as some brown stones in size 12. 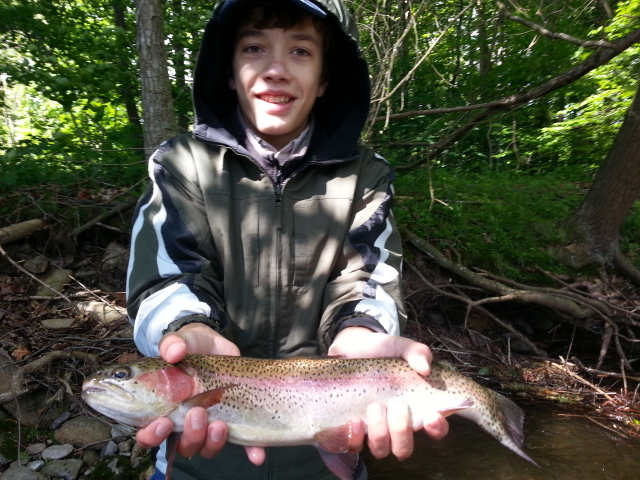 Sam landed two big rainbows, both over 20 inches, and in total we put about 30 fish in the net. We had a great day even if it was one of the coldest days I have ever fished in mid to late May. Reports of light snow above 4000ft and I completely believe it. Feels downright cold. Water temp dropped from 59F to 44F in two days. Probably will drop a bit more after 30sF tonight. Quite a change, and the fish will adjust, and I would rather have this than 80sF and 90F this early. Have a 4 day group trip coming up, including Joe Craig, Locke Clifford, Ron Davis, UNC President Tom Ross, Wendell Ott, and Bill Leinster. Should be a great trip. I will be doing a float tomorrow on the SoHo before they arrive. Stripers and browns……what a combo. Sure hope this cool spell kicks sulphurs into high gear. I have a gut feeling we are on the edge of greatness. Sat. 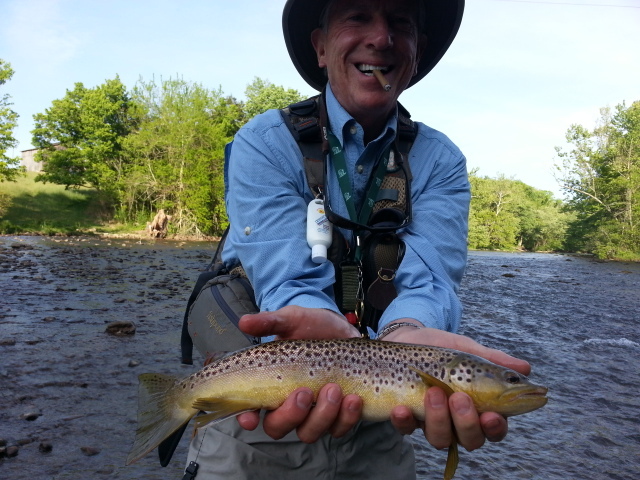 May 17, 2014……Brown and fast …describes virtually every water I scouted yesterday in NC, SW Va, and East TN . That was the net result of 3 to 5 or 6 inches of rain that fell areawide. Only saw two waters I would say were fishable. And the tailwaters in East TN were muddy most of their length. As if that isn’t enough, there were several locations in the high country who saw hail, snow flurries….Mt LeConte, Mt Rogers, Mt Mitchell, Cling man’s Dome……All reported yesterday some measurable snow. I know I could see my breath as temps fell rapidly yesterday. 92F to 33F….what a temperature dive. 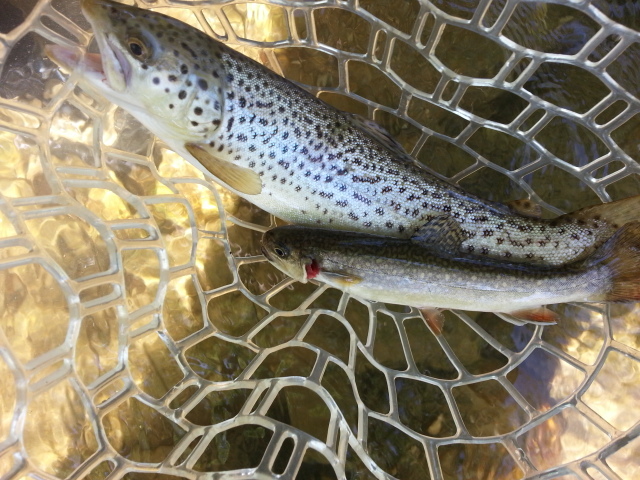 I did fish one spot and caught two nice fish….One brown and one brook trout….Both stripping streamers. Brown water though. But today should be fishable in a few places. I am guiding Harry Winters and Sam Clay, Dallas, TX today and looking forward to a great day. Fri. May 16, 2014….We were due, way overdue in fact, so this comes as no surprise to me. A bummer maybe, but not a surprise. Here’s my report from yesterday and this morning, with rain dripping off of it…..lol. Thursday was a soggy morning in East TN, I can hear rain pounding the roof here on the river……we’ve had around 2 to 3 inches of rain since midnight, and smaller waters are rising. Will be interesting to see how much more rain we’ll get today. Up early tying some flies, and we’ll be heading to breakfast in a couple of hours…..
Well, the forecast proved true….not at first, but eventually. We got our early after some really heavy rains moved through our area between 2am and 6am. Our group was up and out early, breakfast at the diner just down the road from our house, and then we were off to fish. Not many fish rising, rain on and off, the fishing was all nymphing and a mix of midges and sulphur nymph patterns. Everyone still caught fish, probably 50 or so altogether, Shaun Redgate was high man with about 25 of them, he did very well, including about a 20″brown at the end of the day that ate one of my splitcase nymph patterns. Also landed a large rainbow..We had on and off rains to start, then the sky parted for a few minutes, even a poke of the sun, we went down river to another two locations to fish. We had lunch and then the next round of rain came. 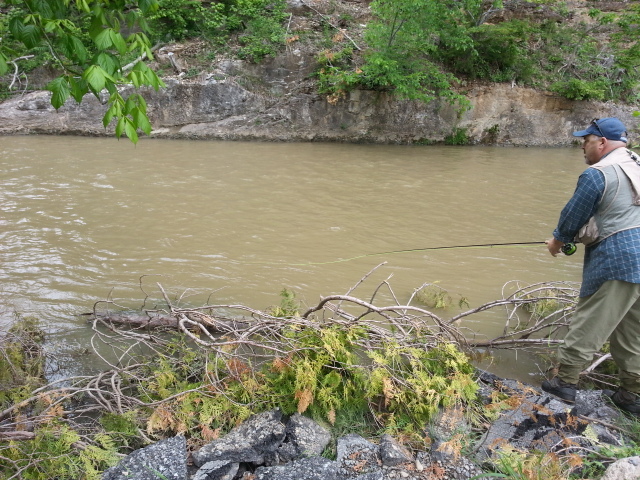 We got probably 1.5″ of rain in an hour, the river rose and got very muddy effectively ending our day of fishing early. Still a lot of fun to be with everyone, we caught some fish, and missed for the most part what looked to blow the entire trip out. 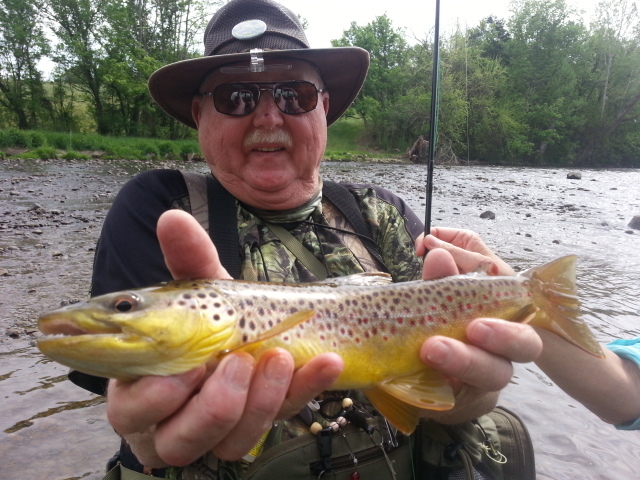 Today, Friday, May 16, I had a guided trip scheduled with JT Pope, Raleigh, NC, TN South Holston, but we postponed /rescheduled due to heavy rains and a muddy river. Cool, 39F this morning…..considering it was 91F two days ago that is quite a change. A 52F temp swing………This morning its colder here than in Montana…go figure. Its May right? Awoke to a nice sunrise, a pretty morning, very crisp…….and a muddy river. I knew after yesterday afternoon’s round of rain we could be in trouble for today. I contacted JT yesterday before they were to leave and told him the conditions and said I felt like it would be a muddy blowout. That is exactly what it was………Should clear in a day or so though….. All the small creeks in the same shape. So if you were planning on fishing today maybe yardwork or honeydo’s are in your future….lol. Considered dropping the boat in and motoring up to the bottom end of the river and going after some big browns and stripers this morning but the river just isn’t a little off color, its red mud muddy. We got almost 3.5″ of rain yesterday, and it will take the day today to clear out. Oh well, will be taking today to tie up some flies for upcoming trips. I have a trip scheduled with Sam Clay and Harry Winters of Dallas, TX, and we’ll be fishing just over the TN line in NC water. Looking forward to a great day. Thurs. May 15, 2014……..Wet and soggy, that is the call here in East TN this morning. Interesting two days as we have been peppered with afternoon thunderstorms and today and last night heavy rain. Here’s yesterday’s report…..
Up at 4am tying some extra flies for todays fishing…..hoping we get in a full day before the heavy rains set in. Looks like a potential soaker….we’ll see….. That was all the word this morning, after an early start , breakfast early, we were on the water early by 8am just in case storms caused us a problem. 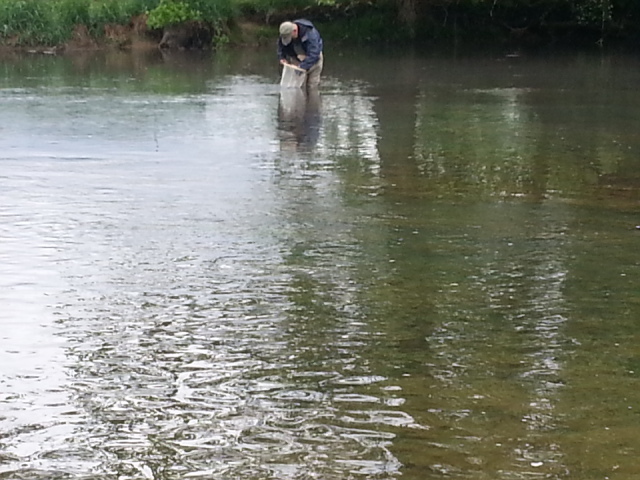 We had decent midge fishing early, both surface and subsurface, then a sulphur flurry that was short lived. All total the group landed about 60 fish or so. It was blazing hot and humid, very hot for this late in the spring. 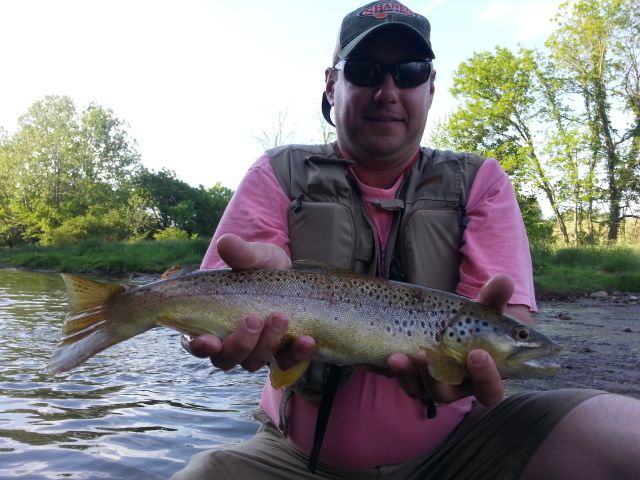 Matthew Foster had the big fish of the day with a brown of 23.5″. 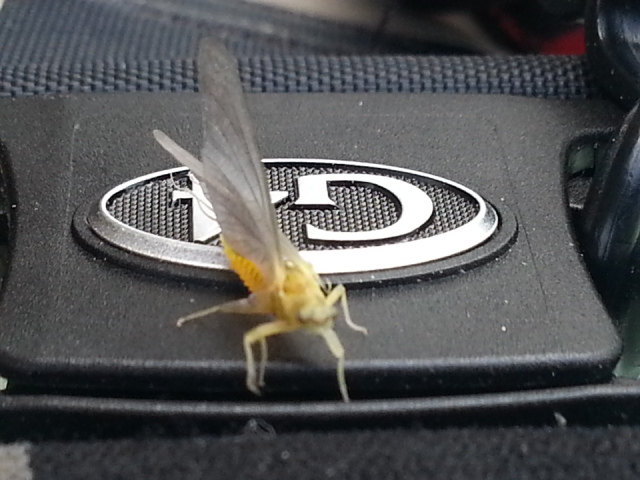 First dry fly flurry in midday in a while as the temps have been hot pushing the surface fishing to early and late……particularly late if you are fishing sulphurs or the sulphur spinner fall. We went downriver for a short time in the afternoon and that is where we finished up with a few fish, and Matthew caught the big fish of the day…. Have some fingers crossed and hoping the heavy rains don’t kill the day…. Soggy morning in East TN, I can hear rain pounding the roof here on the river……we’ve had around 2 to 3 inches of rain since midnight, and smaller waters are rising. Will be interesting to see how much more rain we’ll get today. Up early tying some flies, and we’ll be heading to breakfast in a couple of hours….. 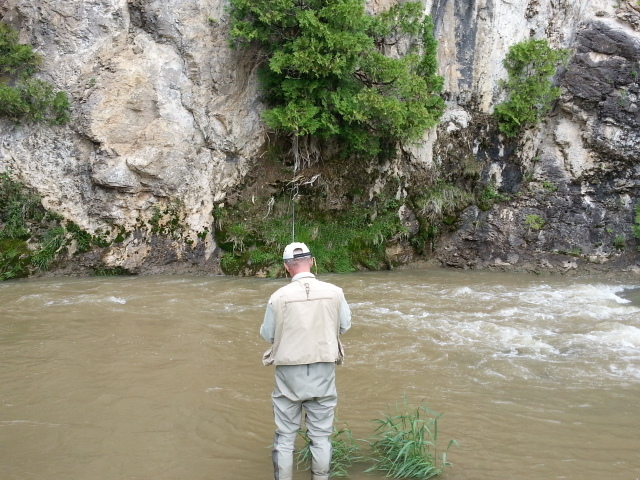 Tight Lines….enjoy your Thursday, more to come…. Mon. May 12, 2014…… Well, as I think I had mentioned in my last post…summer is here. Where did spring go? Really, its almost like it was never here. But one thing is for sure, its been warm. And things are steadily moving toward midsummer conditions already. Just off our first group SoHo trip, one of several annual group trips we do. 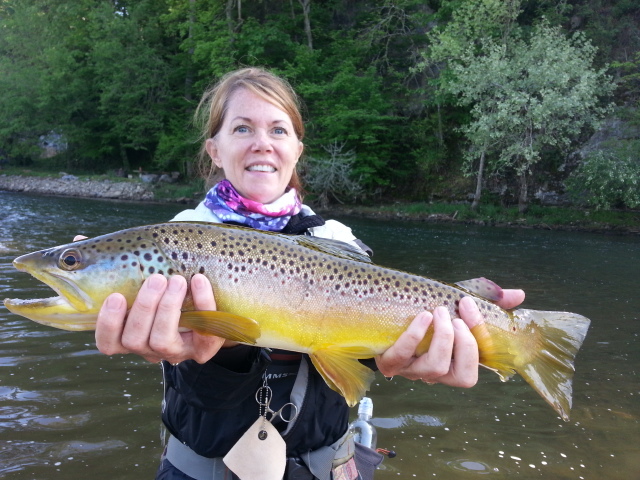 We had some interesting and different fishing…..caught a lot of large fish, and landed one large white sucker (a beast), Patti Nolan landed a 25 inch brown on 6X, and had one client Jim Ritter put the smackdown on a 20in brown trout with a Tenkara rod. So a lot of different and unusual stuff. Sulphur hatch? Where is it? I have heard that a thousand times. My answer? Its all about water temp. You wont get a sulphur hatch when its above 60F. Not here anyway. You can bank on it. Now, let me say what I’m not saying. I am not saying you won’t see a sulphur. I am not saying you won’t see a few sulphurs. There are renegades in everything under the sun. Bugs are no different. Always a few that march to the beat of a different drum. Just like us humans. 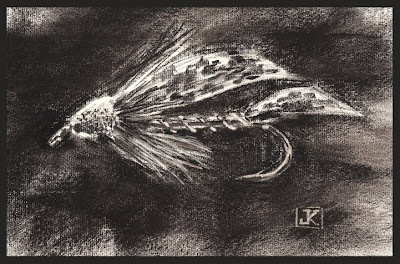 But a hatch where you see insects on water, in the air, fish porpoising, gulping, slashing, jumping….mayfly mayhem…if you have fished with me on the SoHo in May through Sept you ‘ve likely experienced it…..that type of hatch didn’t occur. 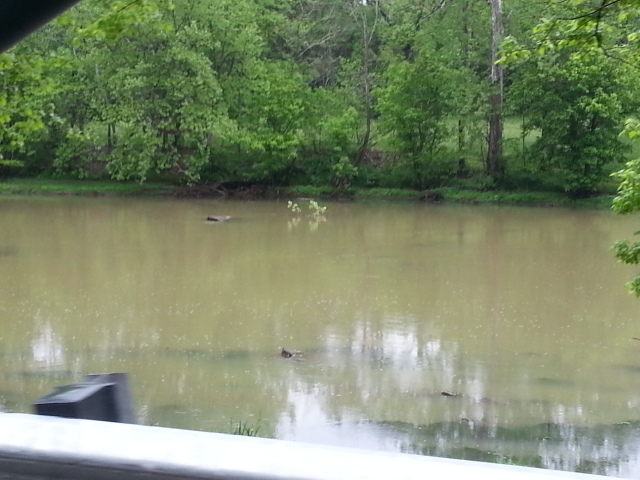 And its not occuring in full force yet on much of the river. And it won’t until some key things happen. Why? 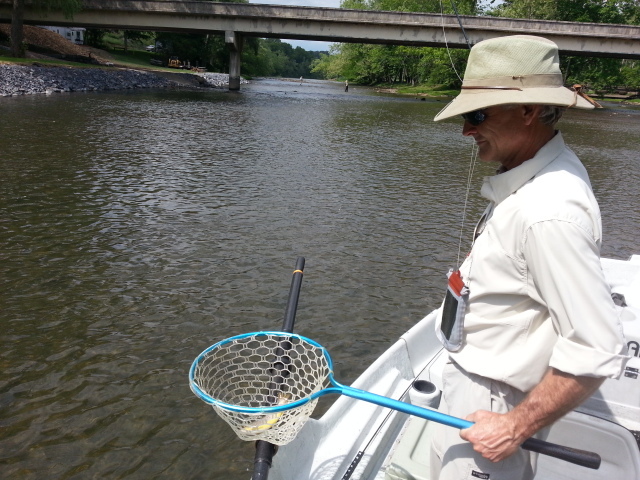 Limited releases because of a slowly rising lake coupled with warmer than avg temps raised river temps above what is the target range of say 52 to 58F for a blanket sulphur hatch, the kind the South Holston is known for…..the NORMAL South Holston sulphur hatch. And until it cools off, we get a good bit of rain, and they release a good bit of chilly water from the dam, it will be hit or miss. But its coming. Any day now. The setup for the trip was the persistent hot and dry conditions of the past month. Temps were pushing 90F when all my guests/clients arrived, and it was downright hot. Hot enough that any sulphur hatch was squelched unless you fished really early or really late. Warm temps and only 1 hr of a half release (1300cfs) three times a day meant very low water and while there were some risers it wasn’t typical of May this time on the SoHo. As a result we did more nymphing than usual, as the fish were ready to eat if and when the bugs showed up on top. Problem was, they did here and there, only for a short time, and it was of such low activity as compared to how it is normally for May that we fished a lot of ground, nymphed a lot, and had to take our shots when and where we could find them. We fished one area a bit more than we ever would and I ever have, even though I know the water inside and out, but it continued to produce and produce large fish that we came back again and again and got results each time, and on a variety of fly patterns. 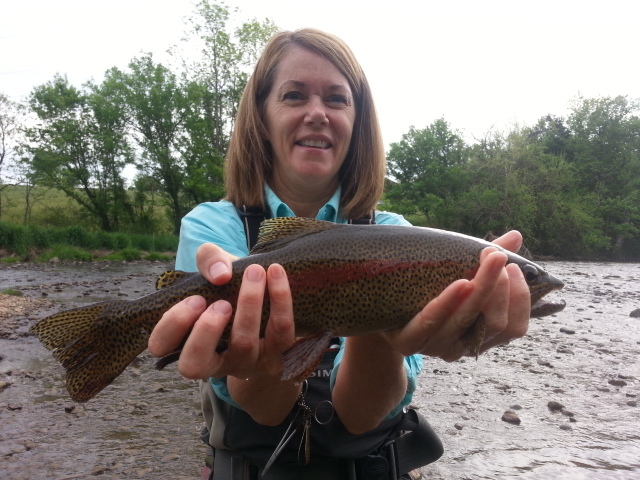 When everyone arrived on Thursday, we headed down to the river and there were a few risers. We nailed a few on dries, some on nymphs, there were spinners in the air, but they didn’t come down until it was so late it was hard to see. And it was limited. We got up early Fri morning, had breakfast in Bluff City at the Diner, then headed out fishing. We did very well, scoring a good many fish, mostly nymphing, a few on dries and swinging soft hackles, and we came back to that time and again throughout the day. We headed up to the house midday/early afternoon, had lunch at Prices, then back to the house for a break, then back out for the late afternoon/evening. Still no hatch to speak of, a few risers here and there, but nothing of note ….at least compared to what the SoHo is known for. We had a decent evening, nailing some pigs…. Also, at the end of the trip I took Jim Ritter and Phil Snyder to a small NC stream for a few hrs as a make up for some bad weather the last trip down as they had come down from Pennsylvania to fish with me. We fished a small water on the frontslope of the mtns, near home, did ok , it wasn’t stellar and dont know if it was maybe fishing pressure from Saturday that impacted the fishing or all the up and down weather changes or what but it was a little off. 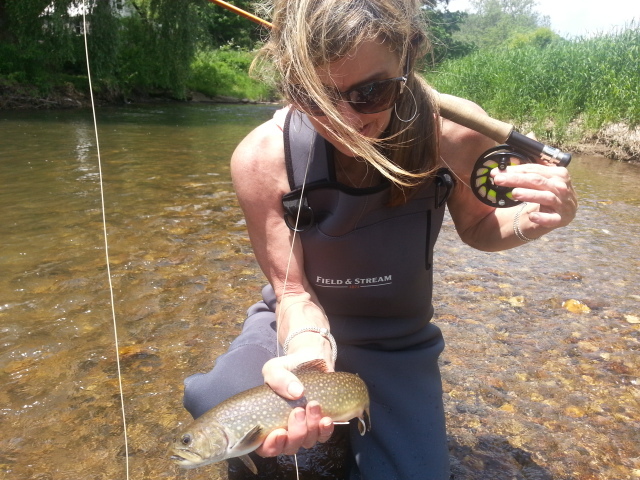 Still caught fish, maybe 15 or so before I headed home to spend Mothers day with my special ladies…… We caught the grand slam though, browns, brookies, rainbows, and smallmouth …..so still a good day. I headed off and Jim and Phil were going to fish a little more then head back to PA.
Busy week coming up, my next group arrives tomorrow afternoon, and I’ll be doing a morning float tomorrow on the SoHo so its a busy time. Looks like we could see some severe weather this week and hoping it doesn’t rain too much. We need some as its gotten mighty dry…and things are hit or miss in terms of coverage and limited in scope. But we need rain. As much as I know what that can do to clear running water. So I say that with caution. 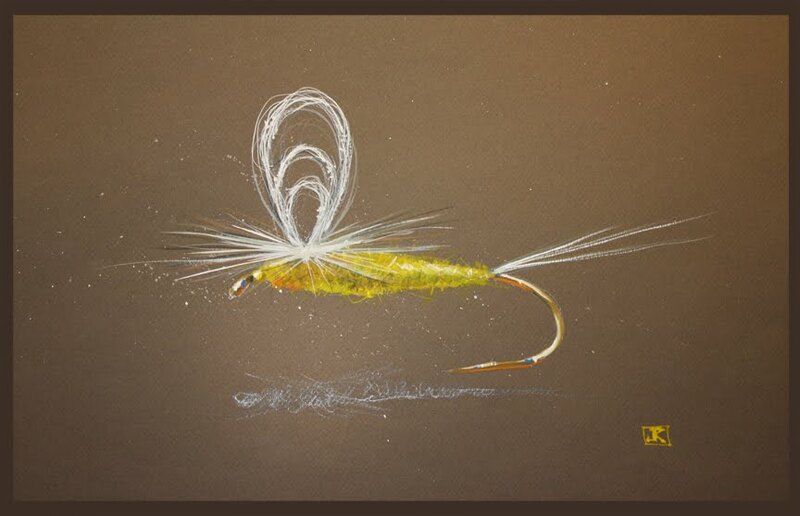 But if you like to fly fish, its time to make hay….. 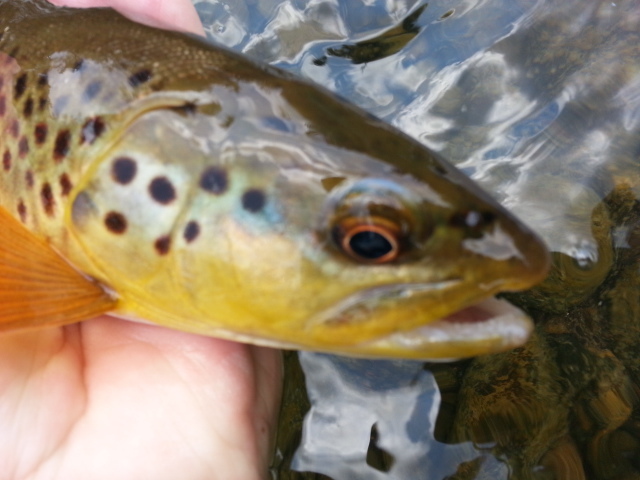 I and many others are guilty of giving the SoHo browns most of the glory, but there are some fine rocket rainbows too…..they even sometimes have an orange cutthroat slash on the underside of the chin……pretty sharp. 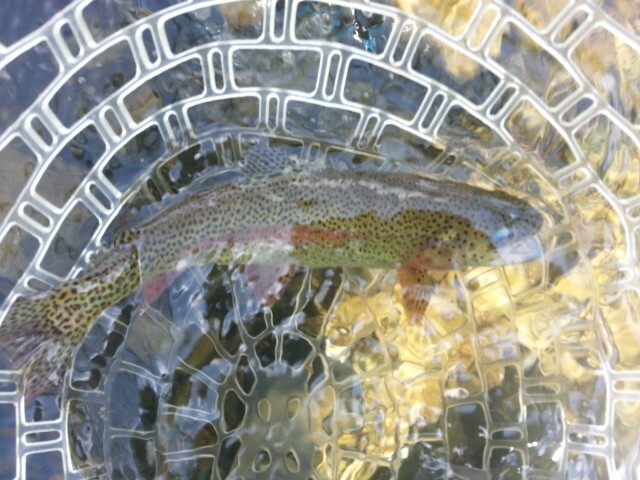 This beaut I landed while trying out Jim Ritter’s Tenkara rod. Wed. May 7, 2014 …Its been a busy start to May, been on the water a lot and so much going on I’ve gotten a little behind on just about everything. Had a great trip Saturday, one of my fellow guides Adam Harman and I guided a group of 8, Tom Wren of Richmond, VA, …Tom’s son Jack was the guest of honor, and was getting married in another month, so today’s fishing trip was his bachelor party so to speak….part of it. In the group were Tom(dad), Jack Wren (son), and friends Brooks Child, Nick Fuerst, Bobby Weinschenk, Jason Collier, Kyle Miner, and Kyle Hibodeau. Adam and I met up with the guys in Winston-Salem, NC, as their hotel was just off from Wake Forest/Baptist Hospital and were were off. Bright and early, 545am, with the expectation there would be a crowd today with the nice, sunny, warm weather. Man was that ever the right call, there were a lot of fishermen, understandably so, as the nice weekend days have been scarce all year. But we did well, right from the start, and were into several fish almost immediately. Adam took 4 of the guys and I took the 4 others. We worked about a half mile stretch of river the first three hours, and scored probably 40 fish or so. It was good, and we landed fish on a variety of nymphs. The water was still up from recent rains this past week. 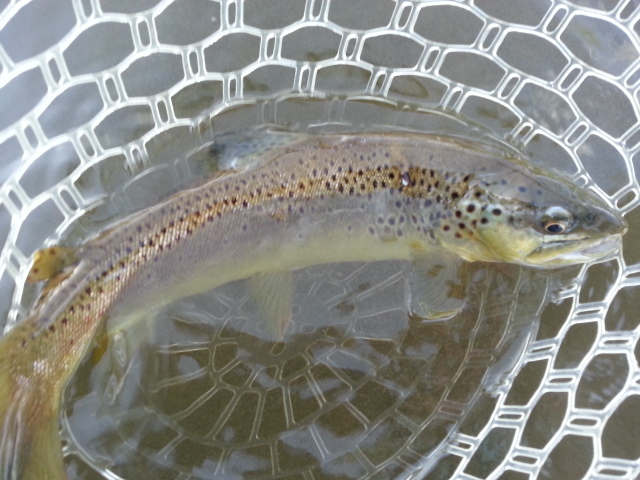 It was slightly high and just a touch off color…..game on , wide open , and killing them conditions for nymph fishing. One reason we did so well. We fished one other spot and then took a break for lunch. 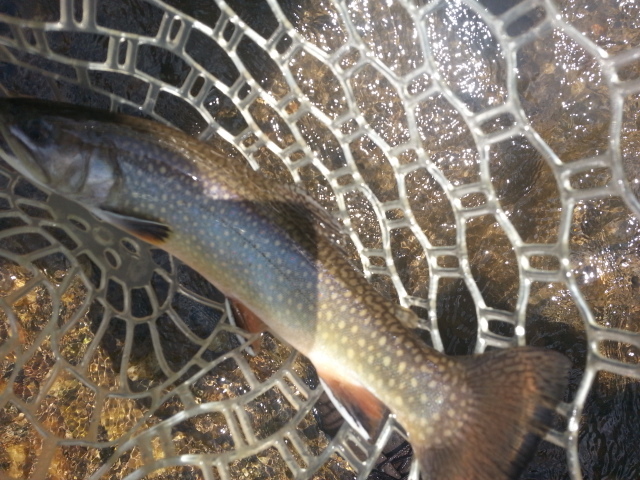 We scored about 20 more fish including a couple citation fish….including one 18″ brook trout landed by Nick Fuerst. We took a lunch break and then hit one last spot, where we landed probably 20 to 25 more fish. I am guessing at least 75 fish landed, and that is a conservative estimate. The guys did a great job. We finished up about 345pm or so, leaving Adam and I a few hours to ….well…..you guessed it…..he and I went fishing. And we did well also. 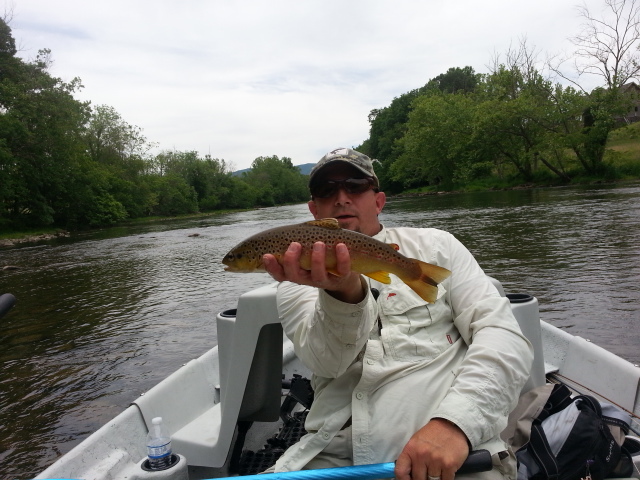 Landed a couple dozen fish, Adam landed one beast of a brown. Great day, great to have the group of guys on the water, and Adam and I had a great day as always……Adam is one of the most talented angler /fly tyers in the area….which is one reason I enlist his help on some of my guided trips. He’s helped me guide trips a while now. Missed a Monday trip w/ Bill and Claudia Groeber, I was loading some gear in and out of my vehicle on Saturday evening and stepped back into my boat trailer coupling and gashed my heel on it. Yikes… Missed a day or two so it could heal. But tough wading and walking on it, so I took it easy on Monday. Had a good day Tuesday, did a lesson/half day with Sandeep Mazumber, Winston-Salem, NC, Sandeep is an Economics Professor at Wake Forest. NC is where we fished, we had a great morning, got a really early start, we were in the water and fishing before 8am, a good move as several others had a similar idea…. but we beat them to the treasure. Good morning though, Sandeep landed 20 fish on his first outing, pretty good I’d say, including one citation brook trout. We caught them on a variety of stuff. The water was in great shape, much improved after the heavy rains of last week….as bad as it was at the time. One sure positive of it for sure. 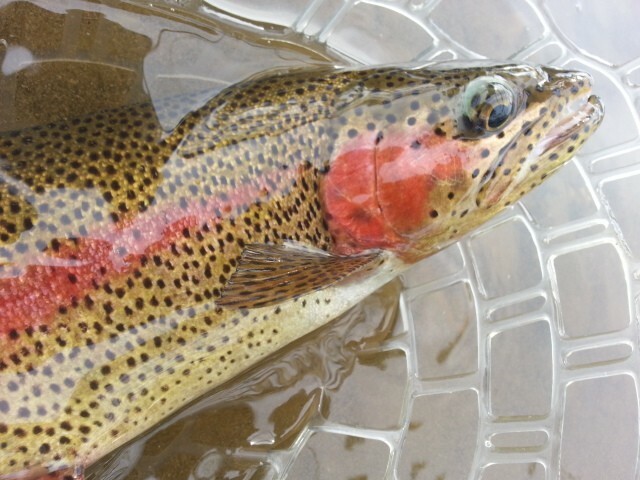 Water temps are in mid 50s and bugs are literally pouring off……lots of rising fish. I’d say if you like to fish drys and don’t get out this week you are missing a real opportunity. Saw the first sulphurs on the NC side of the year. That will remain so though the end of the month, as well as yellow stones…. 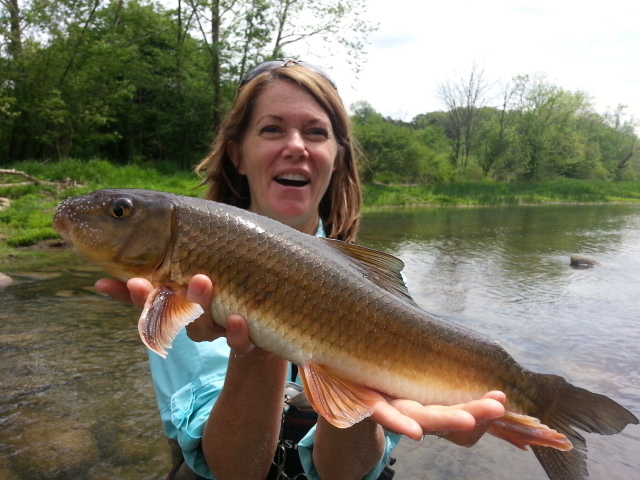 We landed rainbows, brookies, bluegills, smallmouth, redbreast, and two large redhorse…..a mixed bag day for sure. Fly orders continue to be brisk, and we finish up our Fly Fishing 101 class tonight. Great group of folks. I have also been preparing and packing for upcoming string of Holston trips, both wade and floats as well. Sulphurs have begun, fishing has been pretty good, and can’t wait. 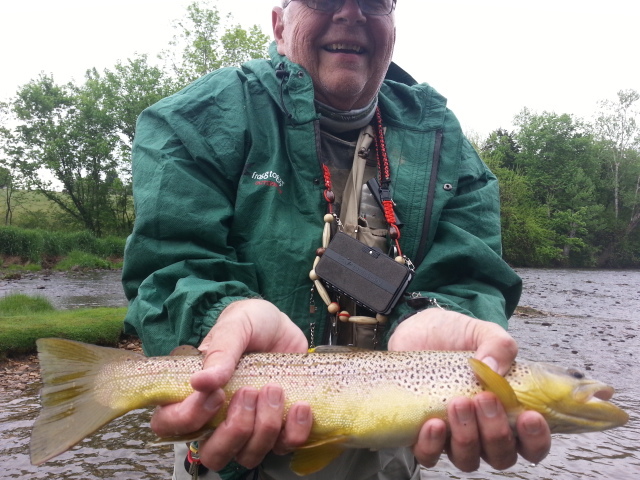 May looks like it could be a great dry fly experience. What a bummer……lol.